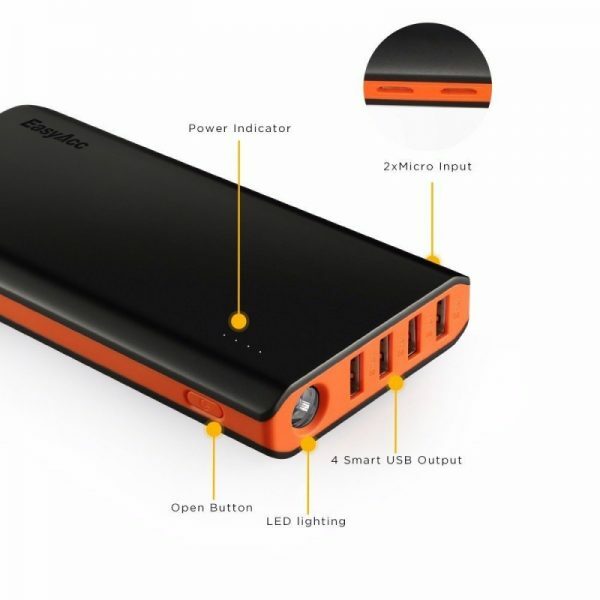 Battery Packs have become an accessory that is a necessity for any one who does any amount of commuting or traveling. Be it from work to home, or be it a day trip or a business trip. We rely on our devices such as phones and tablets to keep us going, and a reliable battery pack is something that we definitely need. It is not uncommon to see battery packs that are up to 10000mAh in size, but EasyAcc have a new beast on the market, and this one gives you 20800 mAh! Interestingly, the overall size and dimension of this actually reminded me of the good old fashioned Tetris games. However, at almost half a kilo, it is quite a heavy beast. Keeping in mind, that is the weight of a typical 7 inch tablet these days! Moving on from weight though, it looks and feels good, and the orange trim with the black colour works well. Interestingly, this features two micro USB inputs, meaning that you can charge it in the same time a 10000mAh battery would charge. 4 outputs and a torch face the output side, while an On/Off (weirdly labelled OPEN in their picture) button lets you operate it. 4 LEDs tell you the state of the battery. A brief set of instructions and a fully charged battery. Two micro USB cables thrown in. Tick, tick, tick! I know I will forget this as time goes on, but a double click on the ON button gives you the torch, while a single click gives you on/off on the ports. Bright? Yes! Great to be able to look into bags, or just under items when you don’t have a torch handy. So, it is capable of dealing with heavy requirements, and can charge items like iPads and big phones. However, 4.8A output means that you can’t really charge 4 iPads in one go. But for general use, you can easily have 4 different devices such as phones plugged in, and not really be bothered about running out of juice. It can charge tablets more than once, and most phones 4-6 times, which should easily let you go through a day, or a few even! 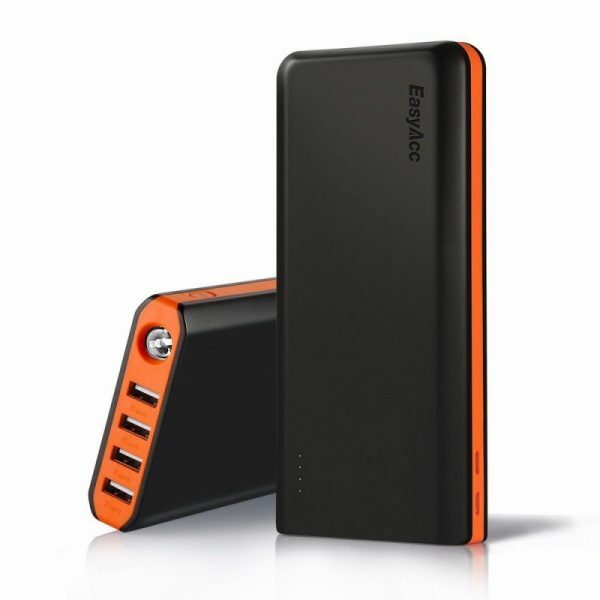 More information on this device can be found on the EasyAcc website, under the 20000mAh Power Bank link. It retails for only £22.99 (Down from £99.99! ), and can be bought via Amazon. At such a price, this is a deal that shouldn’t be missed. Handy, portable and useful!